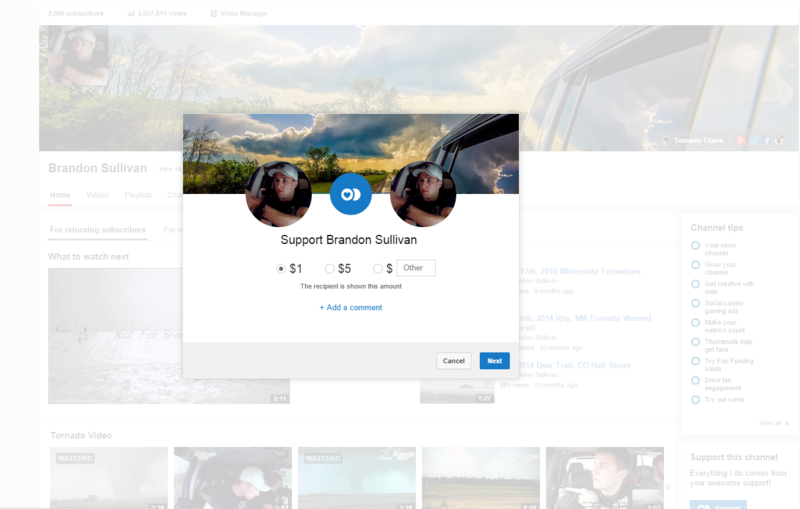 Recently I enabled the “Fan Funding” option in my YouTube channel. This added the “support” button on my page and has begun inserting some options for “supporting” what I do, in some of my videos. With that, inevitably comes some question as to what that really means. My YouTube channel has been pretty popular.. Especially after Shawnee and El Reno videos from last year.. Over 2 million views and 3,000 subscribers, it has done well! Let’s lay it all out here. It’s not a call for help. It’s not a support my chasing fund. It’s not a buy me new cameras fund. In fact, I guess I really don’t know what it is. I guess it’s a, you like what I do, so I’ll keep doing it thing? I don’t charge anyone to read my content. I’m a humble, simple man and I don’t think my thoughts should be hung above anyone. There are definitely smarter people than I. I try to minimize the ads that I use to monetize my web site. Nobody wants to see that crap. Especially if Google decides to throw a half naked person up there for your ad. So, for those reasons, I decided to enable the support me function on YouTube. I guess I find it a bit more appealing than a “donate” button on my page. At least when you go to my YouTube page you see some cool videos and the fury of nature. I sell photos, I sell video, but you all know how that goes. It’s hit or miss, unless it’s your full time job. Not here to ask for “support”. Just here to explain what it is and why it’s there.